As always, May is a very colorful month in Portland. My garden is overflowing with roses and peonies right now. It’s been a super busy month in the studio. Between the Quilt Market party and getting a new pattern out to print, our serene studio has been just a wee bit more chaotic and messy than usual. Plus, I ran a half marathon with my sister, which was pretty damn awesome (my third half marathon). But now that things are calming down, we’re planning to get everything in order in the next couple weeks. What a relief! And I’m ready for June and some truly warm weather and summer dresses, how about you? Follow Colette Patterns on Twitter here. Join Colette Patterns on Twitter! Your flowers always look so beautiful. Do you grow heirloom varieties? Also, new pattern…can’t wait. Any hints on what type and release dates? I do grow some heirloom flowers. Some David Austin roses, heirloom sweet peas this year, lots of other stuff. I am very partial to cottage garden type flowers like foxglove, lupine, ramblers of all kinds, roses, viburnum, the list goes on and on! I mix them all up with fruit and other edibles, and then also have raised beds just for veggies. I grow heirloom veggies here in South Carolina but haven’t tried heirloom flowers. It is so hot here that I mostly stick with knockout roses, salvia, lilies, and Coleus but would love to try cutting roses. So much pink! It’s not really my colour but these photos may be changing my mind. 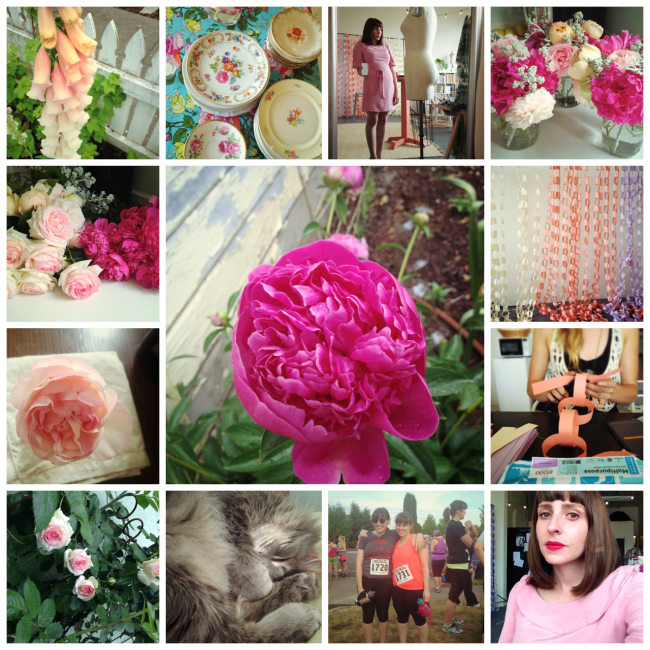 Lovely shots of peonies! The weather is pretty dreadful in the UK- the prospect of wearing summer dresses is quite small right now. Would you ever post about how you got in to running? I know this is a sewing blog, but I’m curious as I’m just getting started myself. Your flowers are so beautiful! Maybe if I can find a way to tie it in! I don’t know how many of you guys would be all that interested. Much like sewing, running is something where you see a lot of progress when you first learn, then very very very slow and incremental improvements over years of practice. A garden overflowing with roses and peonies?? Maybe I’m meant to live in Oregon. Wow, a third half-marathon…you must be so proud! Good for you! Ah, spring blossoms! All I got to see this Spring so far was the Don Valley Parkway flooded yesterday *lol* In all honesty, though, I’m not really sure which is my favourite season, Spring or Autumn – both are so darned colourful. Enjoy the rest of Spring everyone! !